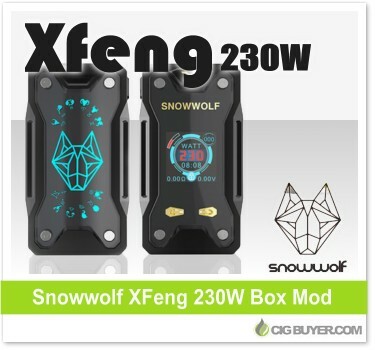 The latest in a long line Snowwolf mods, the Sigelei Snowwolf XFeng 230W Box Mod takes the series to the next level with a sleek, updated design. Powered by dual 18650 batteries, it offers up to 230W of output with precision temperature control (Ni/Ti/SS), TCR and a minimum resistance of 0.05 ohm. The Snowwolf XFeng 230W has a large 1.3 inch color display that can be switched bewteen multiple layouts to provide a vast array of data, including: time, watts, battery life, puff count and more. The unique styling features attractive gold accents with a stylish Zodiac design on magnetized battery cover.